I first heard about Snakyard a few years back because of Faith. She posted about their pesto herbed pork chop and how much she loved it. Since then, I have always wanted to try their pork chop but just never had the chance. And since then, whenever I mention Snakyard, people always say, "ahh the restaurant that's known for its pesto herbed pork chop?!" And I was like, wow. They surely are making a name for their pork chop. It was just last March 2018 that I finally got to try their famous pesto herbed pork chop after our day trip at Sky Waterpark in J Centre Mall Cebu, and I have to say that the rumors are definitely true. Their pork chop is indeed a MUST-TRY! Snakyard started on 2012 as a food stall at the food court in J Centre Mall. And in 2013, they officially opened their first restaurant, still in J Centre Mall. And last year, they opened their second branch at Parkmall, Mandaue and they called it Streetyard. Both restaurants are owned by the couple, Jaren and Charry Ramirez, and their partner, Hector Verde. They thought that breaded pork chops are too mainstream, so they thought of introducing pork chops with sauces. If I'm not mistaken, they first started with the Pesto Herbed Pork Chop. Yes, it's not really original since there were restaurants serving this already at that time, but since they wanted to go beyond the ordinary, they introduced more flavors for their pork chops. Last Saturday, I was invited together with Faith of Sojourns and Stories, Elfe Rain (Youtube Vlogger), and my sister Janica in behalf of Sugbo.PH, for a food tasting event at Streetyard. It will be my second time to try their pork chop meals and to be honest, my second time did not disappoint. In fact, I am already looking forward to having my third time, fourth time, and many more pork chops from Streetyard! Goodbye, diet! Hahaha. Streetyard has a pretty straightforward menu. When we dined at Snakyard, I didn't notice there were other flavors for their pork chop because I was just eager to try the pesto one. So as you can see, they currently have three flavors for their pork chop — Pesto Herbed, Sour Cream, and Hang-over. If you're in for just a light snack, they have nachos, pasta, and grilled sandwich too. But trust me when I say, you cannot go without trying their pork chops! Well since I've been talking so much about their pork chops, why don't we talk more about their pork chops? Hahaha. So they served us all three flavors of their pork chops and just look at how they pretty and mouthwatering they are. For a meal that's less than Php 150 and a serving of pork as huge as that, it's super worth it! According to Charry, she knows the struggle of diners because she's a diner herself that's why they do their best to serve good food in a reasonable serving size at an affordable price. I also got to a taste a little bit of the Hang-over pork chop and it had a spicy and curry-ish flavor which was actually good too. I will definitely try this the next time I dine at Streetyard. Anyway, here's a little thing that I'd like to share to you guys. When the food was served, of course, we took photos of them first. The photo taking session took us a good 30 minutes and you know what was amazing? Our pork chops were still tender and taste so good even after 30 minutes!!! No kidding! As I mentioned earlier, Streetyard has other food options and one of these is their Nachos. They served us the Nachos with the ground beef sauce and it was delicious. The nachos were still crunchy even after 30 minutes too. Haha! For the pasta, we had the Carbonara and I can say that it's really good considering that I'm not really a fan of creamy sauces in my pasta. And wow, for just Php 90, the serving is pretty huge it's good for sharing! That's me looking at my pork chop with so much love and excitement because I can't wait to try it. Haha. So guys, please do visit Snakyard and Streetyard! Their pork chops are really the best! 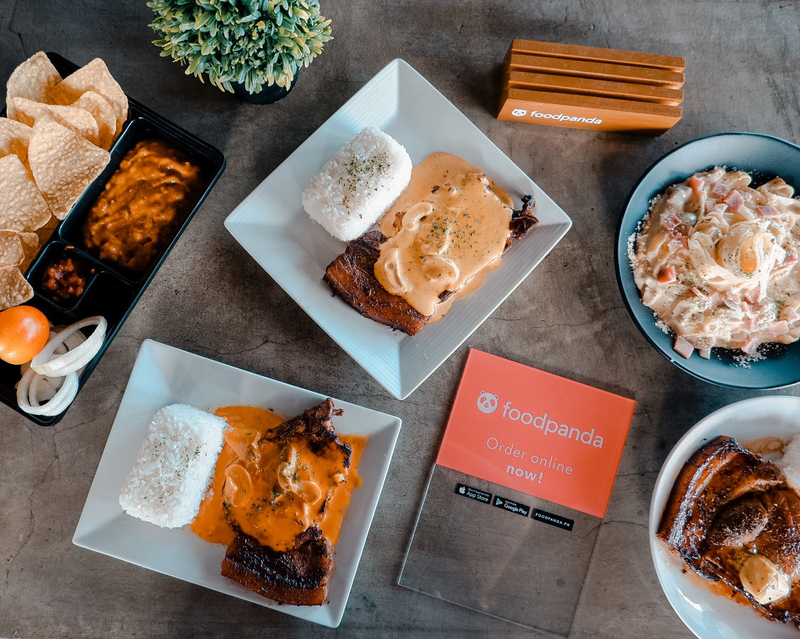 Snakyard and Streetyard are now available on Foodpanda! I also have good news for you! If you don't have the time to visit their branches at Parkmall or J Centre Mall, you can now eat your favorite pork chops without the hassle of going out by ordering through Foodpanda! Just go to these links to start ordering: Snakyard / Streetyard. Omg, super sarap naman ng hitsura ng porkchop!!! T__________T Can't believe ang afforable pa. It's really really masarap, Toni! I just went back last weekend! Super affordable, super huge servings, and super sarap! Hope you can try it when you go here in Cebu!